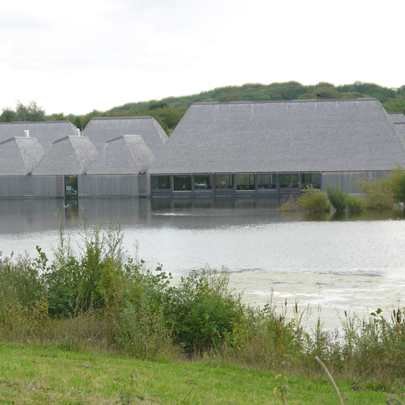 Made-to-measure satin-brushed stainless steel worktops and sinks from GEC Anderson have been used to enhance the light and contemporary spaces at Brockholes Nature Reserve near Preston, Lancashire. The nature reserve was formed over 5 years out of a former gravel quarry, with a range of habitats added to existing woodlands and water, carefully crafted to attract different species of birds, animals, fish and plant life. The project is the winner of 2 Civic Trust Awards and has achieved the new and highest rating of sustainability, BREEAM Outstanding for interim design stage. The buildings and open spaces form a village-like cluster, floating on a large pontoon and include various facilities such as a caf, gift shop and information area. The kitchenette is situated in the conference centre, which is available for hire by companies and individuals for private functions. The small kitchen space is used for general washing up tasks as well as for the storage of crockery and cutlery, includes two GEC Anderson made-to-measure brushed-satin stainless steel sinktops. Designed to fit the compact space available, the stainless steel worktops combine robust functionality with their professional and attractive appearance. The Education Classroom is situated in the Visitor Village and accommodates up to 60 people. It is used for school and adult education activities during term time and family activities during school holidays. 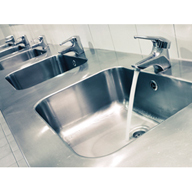 A single piece, 3.5 metre, GEC Anderson made-to-measure brushed-satin stainless steel sinktop is located within this area, that includes a special 2.2 metre trough sink to a 180mm depth. 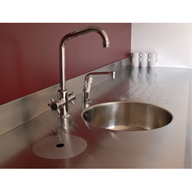 This special trough sink is used for general wet activities and for cleaning of art and craft equipment. For the architect, it was also the obvious choice for this busy educational space, as it is hard wearing, hygienic, maintenance free and retains its original appearance over time. 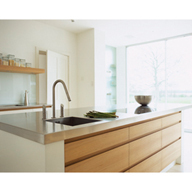 GEC Anderson was also chosen for their ability to provide the sinktop configurations to meet the design requirements.